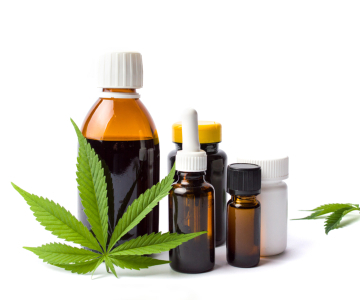 Medical cannabis refers to using the whole, unprocessed cannabis plant or its basic extracts to treat symptoms of illness and other conditions. It is also known by several other names including weed, marijuana, grass, hash, or pot. Cannabis can be used in many different ways including smoking, vaping, consuming edibles, and applying topical creams or oils. The U.S. Food and Drug Administration (FDA) has not recognized or approved the cannabis plant as medicine. However, there have been scientific studies of cannabinoids, the chemicals in cannabis. The two main cannabinoids that are of medical interest are THC and CBD. The FDA has approved two drugs that contain THC. These drugs treat nausea caused by chemotherapy and increase appetite in patients who have severe weight loss from AIDS. There is also a liquid drug that contains CBD. It treats two forms of severe childhood epilepsy. Scientists are doing more research with cannabis and its ingredients to treat many diseases and conditions. National Institute on Drug Abuse: Is Marijuana Medicine? National Institute on Drug Abuse: What Is Medical Marijuana? The Food and Drug Administration has approved two cannabinoid based medications for the prevention or treatment of chemotherapy related nausea and vomiting. Clinical trials are research studies that test how well new medical approaches work in people. For more information about clinical trials, see the Cancer Basics: Clinical Trials Information Guide. Current and completed clinical trials using medical cannabis for a variety of conditions. Current and completed clinical trials using cannabinoids for a variety of conditions. The laws governing the use and possession of cannabis can be complicated. Cannabis remains classified as a Schedule I agent under the federal Controlled Substances Act, and its purchase, possession, distribution, or use may be unlawful under federal law. Laws may vary by state and even by county. Under California law, it is legal for adults 21 or older to possess, consume and cultivate cannabis. However, there are regulations that determine how much an individual can possess and/or cultivate. Sale of cannabis from licensed retail outlets became legal January 1, 2018. You can also use cannabis if you are 18 or older and have a current qualifying physician’s recommendation or a valid county-issued medical cannabis identification card. California Department of Public Health: Let's Talk Cannabis - What is Legal for Adult Use? Quick fact sheet on the laws for adult use of marijuana. The California Department of Public Health has put together a website with important information about legal issues, health, and other helpful information about the use of marijuana.